Well, as you say, there’s nothing wrong with laziness as long as nobody finds out. I’ve certainly used my fair share of things like garlic powder and tinned anchovy, after all. 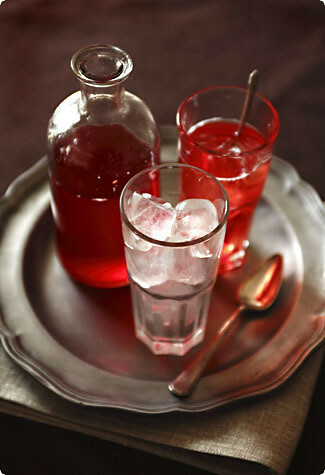 :)As for the quince cordial, it looks wonderful, and I’m wondering if you would consider it a winter drink? That is, there’s snow outside on the ground, and I’m not sure making bright red drinks to mix with champagne over ice is what I should do the next time I have friends over, but it sounds so good! Colin – To my mind, anything with champagne is a year-round drink! 🙂 But champagne aside, there are plenty of cold drinks that crop up at holiday parties, and this cordial with its beautiful ruby color seems like quite a Christmas natural. Not to mention that quinces themselves are most definitely a fall/winter fruit, so I think you’d be perfectly justified serving it even with snow on the ground. dear melissa, i think the phrase "crafty cook" sounds so much nicer than "lazy cook" 😉 i, for one, am all for passing off slothful shortcut-taking ways as sheer cunning…what a brilliant recipe – the very best sort, in fact, that looks terribly complicated and involved yet is in reality a snap! These photos are just beautiful. We don’t see quinces around here, so I’ll have to content myself with looking. The reds are just gorgeous. Oh my goodness, what a gorgeous photo! Stunning.I might have to reconsider the quince. oh, damn, this really is lazier than my version of a quince dessert. There you have to halve the quinces and cover them with grated sour apples. The rest is the same. I am won over! Well, I made the quinces and the cordial almost immediately after you posted this entry. The quinces were delicious, and the quince-champagne cordial was very tasty, if a bit sweet for my palate. I also had to increase the champagne-to-quince ratio to about two-to-one because I found the drink to be too syrupy.Overall, it turned out great! Thanks! 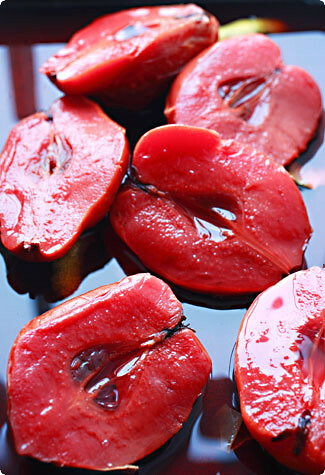 I have never had braised quinces, but that wonderful red color — too glorious to resist! Who cares if it’s easy to make?! Hi Eva – While they might last in the fridge for four weeks, I think I’d freeze. I haven’t done it myself, but I looked around online and several people report cooking and freezing quince segments with no problem. Let me know how you like them! I know this is an old post but I just came across it as I have a few quinces left from the nearly half bushel I culled from my tree and even after giving half of those away! I have made a quince and cranberry chutney that I may share with the in-laws at next week's Thanksgiving dinner but this one is calling me. I hope the quinces are still intact enough to make this – it would be a shame to have to wait until next year. Thanks (belatedly) for a beautiful post and those exquisite photos! Thanks for the cordial idea, I wanted to make that this year, wonderful! My kitchen is full of the perfume of cooking quinces….